With the exception of Ivor Luk, all the Falcons returned for the 2003 season. The team was back together again. There were also four strong new additions: Ryan O’Neil an experienced Australian. James Cameron a South African international, Liam Bath a GB all rounder with the best slide in British baseball and Dave Hamilton an exceptional outfielder. The Falcons were ready to begin. Unfortunately as the season progressed it became impossible for Stuart Boast to continue in his full capacity as manager. At Stuart’s request Lee Manning took over the coaching and game management of the team. Now was the time to start building the team up and the Falcons returned to league games with a competitive edge. A new league structure meant that the teams were playing for position right from the outset as half way through the season the division would be split in half. It was not a winning start, they lost by one run to the Milton Keynes in the first game. However this did not seem to dent the enthusiasm. 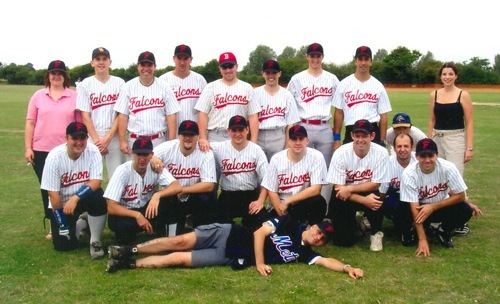 The Falcons went on to beat Croydon’s third team 30 runs to 16 and Bournemouth Sharks 26 to 15. Two losses and a win followed but it was enough to secure the Falcons place in the top half of the table. The Falcons went on to finish 4th out of 12 over all. Playing the second half of the season against the better teams really helped player development. One game that must be mentioned is the fixture on 10th August 2003 at Richmond. This was played on the hottest day ever recorded in British history. Lee started the game with mostly the new players controversially leaving Liam and James on the bench. The first innings of these games was the best baseball I have ever seen the Falcons play. They were playing as a well drilled team, creating plays, concentrating and focused. They were also holding their own against the best team and pitcher in the league. Sadly thay did not win this game, they lost 9 to 5 in the end, but they should always remember those innings with pride.